TAC (INDIA) UL (USA) APPROVED KIRLOSKAR PUMPS AND ENGINES. PREWIRED AND PIPED COMPACT PACKAGES REQUIRING ASSOLUTE MINIMUM WORK AT SITE. NO NEED TO DISCONNECT SUCTION DELIVERY PIPING AND DIESEL ENGINE WHILE SERVICING PUMP. ENGINE CONTROL PANEL INCORPORATING AUTO / MANUAL STARTING SYSTEM WITH AUDIO VISUAL ALARMS. LOCKABLE BATTERY STAND AND METAL SPARES BOX. CHANGEOVER SWITCH FOR BATTERIES – NO NEED TO RECONNECT DURING EMERGENCY. MOST ECONOMICAL PACKAGE FOR EACH DUTY. Packages for converting existing hydrant system into automatic system. 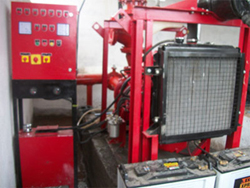 Automatic hose reel pumping package. Turn key contracts in fire protection systems including hydrant, foam and sprinkler systems. Our wide experience in installing number of Fire Fighting Pump sets and Control Panels has led us to the conviction that the rationalization of the site installation work is the key to overall efficiency of FIRE PROTECTION SYSTEMS. VANPAK – 904 constructed by skilled staff under controlled condition of our factory, reduces the site work to the absolute minimum. KIRLOSKAR make horizontal SPLIT CASE PUMPS or END SUCTION PUMPS with SPACER coupling, which are approved by TAC (India), UL (USA). The pumps also meet FOC (UK) requirements. There is no need to remove suction delivery piping, and diesel engine during maintenance of pumps. Discharge – 27, 38, 47, 76, 114 litres per second. Head - 7.0, 8.8, 10.5 Kg/cm.sq. Other duties on request. Torsional vibration analysis is carried out for each combination of pump and engine. Suitable for 6 hours running of engine, epoxy coated, with magnetic oil level indicator and low level alarm contact. For automatic and manual operation of Diesel Engine. Three kick timer with 5 seconds, cranking and 15 seconds dwell. The duration is adjustable. Low lube oil pressure, low diesel level, over speed, set fails to start, high water temperature. Set running, hydrant pressure normal, hooter off. Stroke counter to register each start of the engine. Connecting points for remote panel. The above are fitted in steel cabinet, rain tight with cable glands. Battery charger with boost trickle charging facility ia selector switch. Two separate battery chargers – One each for main and stand by battery. Indication lamp for battery and standby battery, and power on. Change over switch from main to stand by battery. Suitable for 10 consecutive stars of diesel engine with lockable enclosure. One set working and one set standby. Batteries are provided with necessary cable and lugs. Fuel lift hand pump with 20 mm outlet is provided. Pressure gauge for main pump. Compound gauge for main pump. Pressure gauge for cooling water inlet to H.E. To be connected at site after NRV. 3 M long flexible rubber pipes are provided for the purpose. Five meter long exhaust pipe with bends, flanges, gaskets, and asbestos rope (loose) provided for site erection. Water Booster solve the water supply problems, of 3,82,000 Residents in Pune. Over 40 installations since 1997. 5 Mcub/Hr. to 5000 Mcub/Hr. Under ground or above ground installation. Adjustable pump speed controls-assures optimum energy consumption. Factory assembled, tested, shipped complete. Automatic operation. Custom designs available. One year warranty. Quick delivery. Useful for online Boosting, ESR filling, increasing capacity of existing distribution net work. Water boosters are packaged pumping systems designed to work efficiently in a wide range of duty conditions automatically. Constant or variable speed special pump, control valves, Hydro pneumatic tanks, suction delivery piping, all mounted on a base frame, suitable housing, make the units compact, easy to install and operate.